We all love trips. Isn’t it? And if it includes not just one but many interesting tourist destination then the trip is sure to grab the top most place in your list of favorite holidays. A trip to Golden Triangle is one such. The Golden Triangle in India is the tourist circuit which mostly includes three tourist attractions namely, Delhi, Jaipur and Agra. However other popular cities of Rajasthan and other north Indian tourist attractions can also be included as per travelers’ interests. These tours do offer exciting holidaying opportunities. You can have these beautiful moments for sure by opting one of the various tour packages of Holidays DNA. 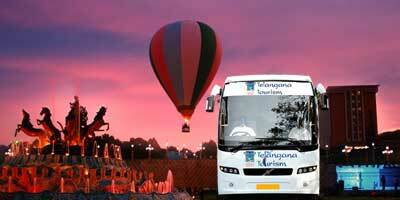 And the good news is that we have recently come with many interesting Golden Triangle Tour Packages from Hyderabad. 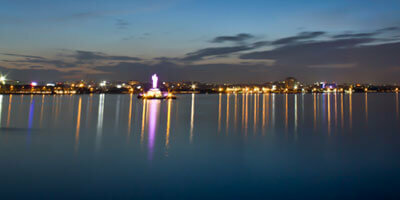 So now from the Deccan city of Hyderabad you can plan your tour to the famous Golden triangle of Indian continent. Delhi, the capital city of India attracts thousands of tourists from all over the world. This historic city has not just monuments and ancient ruins to offer its visitors but a beautiful amalgamation of history with modernity which is adorned with a tint of vibrancy and luxuriousness. Various cultures coming together and forming a unique environment is what makes Delhi an attractive place to visit. Jaipur, the Pink City, situated in the state of Rajasthan, is a must visit for all the travel enthusiasts. City Palace, Jantar Mantar, Hawa Mahal, Rambagh Palace, Chandra Mahal, Amber Fort, Jaigarh Fort, Nahargarh Fort, Jal Mahal, The City Palace, Diwan-e-Aam, Central Museum (Albert Hall Museum) are just a few places to visit while staying in this glorious city. Agra with the fame of world famous Taj Mahal has many other reasons too for captivating its visitors. Fatehpur Sikri and the Agra Fort along with culturally rich environment and amazing shopping opportunities are a few other reasons for visiting this beautiful city, located in the state of Uttar Pradesh. Of usually 5 or 6 day and 6 or 7 nights, these tours can be even of longer duration if you want to explore the various places of North India with leisure. We do customize tour packages as per your requirements and budget limits. Thus we cater to everyone and their varying preferences which can range from budget travel to luxurious one, from long holiday to a shirt one, family holiday to honeymoon, etc. What makes your Golden Triangle Tour from Hyderabad even better is the fact that we take care of almost everything associated to your holiday. So you can sit back and relax while we make the best arrangements for your journey. Some of the facilities which are offered in our tour packages are ticket booking for all the three modes of transportation flight, train and bus; reservation of rooms at an accommodation of your choice in all the cities of your halt, transportation from airport or railway station to your hotel, taxi booking, arrangement of guides if required, etc. Or submit the following Enquiry form, and Holidays Zone shall call you back promptly. Daily - 9 AM to 8:30 PM. 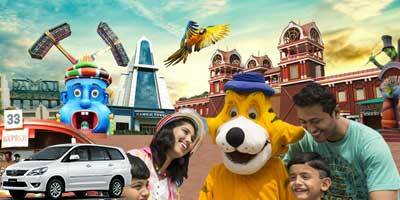 #Ramoji Entry Fee Included. #Pick & Drop from Hotel / Home by Ac Car. 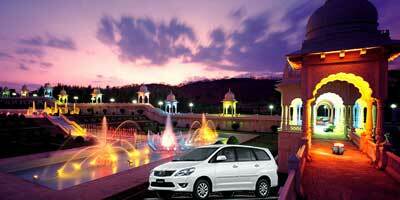 Daily - 9 AM to 8:30 PM #Ramoji Entry Fee Included. #Buffet Lunch. #Pick & Drop from Hotel / Home by Ac Car. Ramoji "General" 1 Day Tour Package by BUS from "Telangana Tourism"
Daily - 7:30 AM to 7:30 PM #Ramoji General Entry Ticket Included. #Pick & Drop by Bus from various City Points. Daily - 9:30 AM to 8:30 PM. 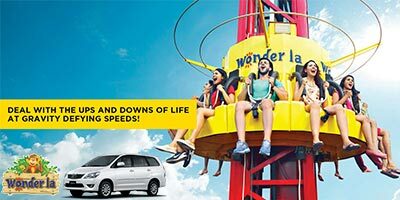 #Wonderla Hyderabad Entry Fee Included. #Pick & Drop from Hotel / Home by Ac Car.